Jobs at small businesses are not necessarily small potatoes. In fact, according to new data from the job site Indeed.com, some of the most hired people by small businesses posting openings on the site are top wage earners. The top job in demand at small businesses listing on Indeed remains Truck Driver. Previous data from the company shows that transportation-related positions are among the most sought after by small businesses. Of course, that’s not to say other less in demand jobs pay less — as data from Indeed.com further shows. A quick glance at the other nine top sought after jobs on the list show positions that tend to command higher pay. Registered Nurse, Physical Therapist, Speech Language Pathologist, Occupational Therapist and Travel Nurse are all medical positions — all good wage earning jobs — that are being actively filled by small businesses. “Skilled roles in healthcare dominate the list of most popular jobs small businesses are hiring most,” says Paul Wolfe, Indeed senior vice president and head of HR for the job site. For this list, Indeed calculates the percentage share of jobs posted by small businesses from January to March 2017. 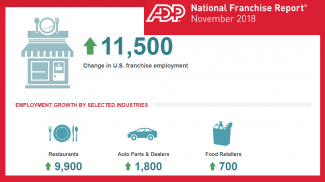 “As small businesses are often an indicator of the state of the job market, we think it is a positive sign to see high-earning positions like registered nurse and physical therapist at the top of this list,” Wolfe says. 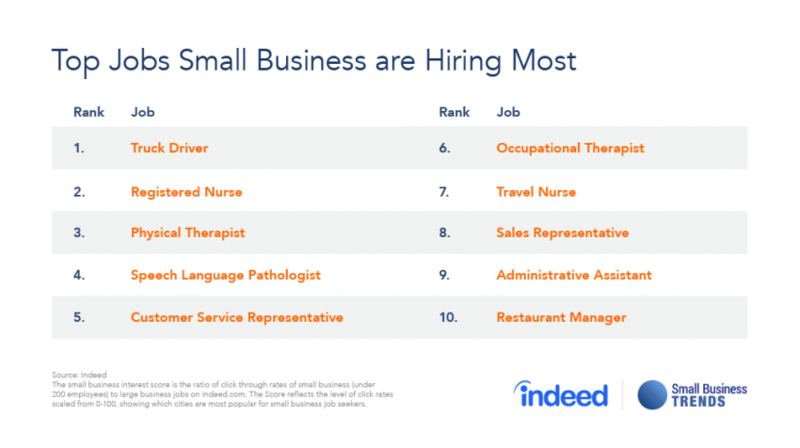 Customer Service and Sales rep positions are also being actively filled by small businesses through Indeed, according to the same data. Administrative Assistant and Restaurant Manager also sneaked into this list of jobs being regularly filled. It can be argued that at least 8 of the 10 jobs on this list are ones that can or should make a decent wage. So, small businesses hiring for these jobs are making an investment in their future by filling them. 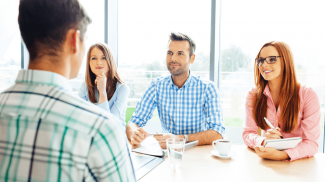 This means mistakes in hiring these positions could cost small businesses dearly. And since these jobs generally carry some level of higher responsibility and liability, small business owners hiring them should do their homework on candidates before offering the job. Business owners are willing to pay for quality jobs. They are now willing to spend to find the right person.